The focus of OVP is to accelerate the adoption of the new way to develop embedded software - especially for SoC and MPSoC/multi-core platforms. If you are developing software to run in an embedded system you will probably already be using an Instruction Set Simulator (ISS) and associated debugger. As you move to having multiple processors or cores in your design then you will need more than just a single ISS. What is needed is a model of your platform that includes models of all the processors or cores and models of the peripherals and behavioral components that the software communicates with. This is a Virtual Platform, or more simply just a simulation model of your design. OVP provides this for you: libraries of processor and behavioral models, and APIs for building you own processors, peripherals and platforms. There are even platform models available as source (we call these Extendable Platform Kits). This is just what is needed to use existing models or build your own, and OVP is easy to use, open, flexible, and importantly, free for non-commercial use. 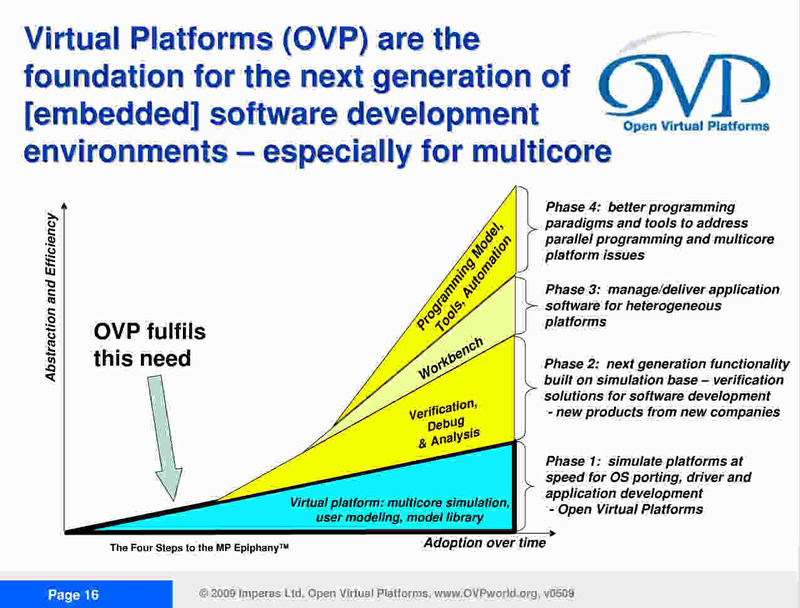 If you want to understand the rationale for the use of Virtual Platforms and the industry developments that have driven the creation of OVP - please look at the slides or listen to the presentation from Imperas, the company who developed the base for OVP. If you want to see who is involved with OVP and what the industry is saying then please visit the news pages. "30 to 50 per cent of R&D budgets are spent on software, and the cost is rising 20 per cent a year. The software effort overtakes the hardware effort at 130nm." "Some say we are at a crisis stage with the software side overwhelming the hardware side. Driving some of this is the proliferation of cores in system-on-chip (SoC) devices." Adopting Virtual Platforms enables earlier development and testing of software, dramatically reducing SoC schedules and should significantly reduce initial development and maintenance costs for embedded software. "Imperas believes that software virtual platform infrastructure and models should be free and be freely available. To that end, we are sharing, making public, and making available our simulation infrastructure technologies with the intention of establishing a common, open standard platform for software virtual platforms for software developers. We started developing our simulation infrastructure in 2004 and it has been in customer production use since early 2006. We are donating this technology to OVP. However, it is not solely through our efforts that these technologies become successful. Participation of organizations and individuals around the world is critical to the success of OVP. We thank all those that are participating in this community." Please sign-up for and participate in the forums, have a look at new developments, and please do download some of the examples, get a feel for the benefits you can get from the adoption of OVP - and please use OVP in your commercial, research, or educational projects - and use the forums for feedback, advice, questions - and to get involved please go to the "get involved" forum!